Hakuna Matata, friends! This week Kelly is taking us to one of the best live shows in Walt Disney World. 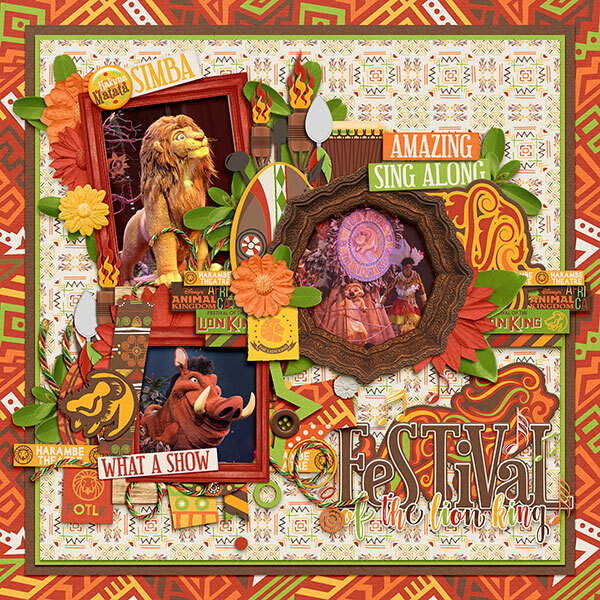 Her newest collection, Lion King Festival, is a celebration of our favorite Lion King characters and music at Disney’s Animal Kingdom. Create stunning layouts of this show, character meet and greets and meals, hanging out Animal Kingdom Lodge or the park. Make sure you grab the amazing Page Starters, Journal Cards, Word Art, Word Flairs, and Page Starters to complete your stash. Inside the kit you will find 15 gorgeous African themed papers and a full alpha set. Also 60 unique elements including character flags, drum, elephant, giraffe, lion, lion head, music notes, pennants, shields, sign, Simba, spear, stars, sun, torch, and much more!